#MyLACOSTEwatch es una iniciativa de LACOSTE que te ofrece la oportunidad de diseñar tu propio reloj, compartirlo en Twitter con el hashtag mencionado y participar en el concurso a través de la app de Facebook. Hazte fan, envía tu diseño hasta el 14 de octubre y consigue tu reloj GOA LACOSTE. 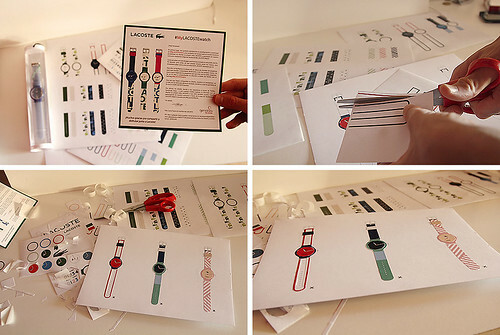 #MyLACOSTEwatch is an initiative from LACOSTE that offers the opportunity to design your own LACOSTE watch, share it on Twitter with the mentioned hashtag and participate in the contest via the Facebook app. Become a fan, send your design before October 14th and get your GOA LACOSTE watch.